The second generation of the Porsche Cayman was unveiled at the Los Angeles Auto Show recently where the dimension modifications to the Cayman were clearly visible. 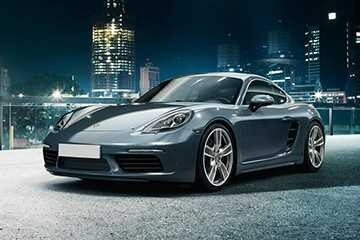 As usual the new Cayman was built along the same lines as those of its kissing-cousin, the Porsche Boxster. We find that the mid-engined Cayman now sits on a new platform that provides for better weight distribution. In terms of dimensions, we find the new Cayman is now stretched by 35mm in length and a mere 1mm in width. The body is now mostly of an aluminium build to help with the weight reduction profile and the new body design is more cuts and edges than curves as was evident with the previous models. The extra large cooling ducts preceding the wheel arches are evidence of this fact. The interiors do not boast as many changes and is mostly similar in styling to the old Cayman but with added levels of accessibility. The longer dimensions now support greater seat adjustment and also improved storage. Porsche have claimed a luggage space of 310-litres in totality if both front and rear luggage compartments are utilised. The new Cayman is being offered with the same 2 engine choices as with the previous models; however the older 2.9-litre mill is being replaced by a new 2.7-litre 6-cylinder straight configuration engine and the old 3.4-litre mill has been re-tuned for an extra 5bhp. The 2.7-litre engine will generate 275bhp while the re-worked 3.5-litre engine will crank out 325bhp at peak rpm range. Along with the engines, the Cayman also offers 2 choices in transmission; the standard 6-speed manual and a 7-speed dual clutch transmission.